While we have tried to present a summary of the essential information on this topic, be aware that other items, such as local regulations, may apply to you. Please read the disclaimer. Whether your facility has laundered shop towels/rags or disposable wipes, this rule governs the management of the waste on-site and how to recycle or dispose of them. On July 31, 2013 the rule that governs the disposal of solvent-contaminated wipes was finalized to exempt spent solvent-contaminated wipes from hazardous waste regulations if the waste meets certain criteria. Effective January 31, 2014, spent shop rags and paper towels used with parts cleaning solvent are no longer subject to a hazardous waste regulation if managed appropriately (and not otherwise governed by state or local rules). The purpose of this final rule is to provide a consistent regulatory framework for solvent-contaminated wipes that is appropriate to the level of risk posed by these wipes in a way that maintains protection of human health and the environment, while reducing overall compliance costs for industry, many of which are small businesses. Under the Resource Conservation and Recovery Act (RCRA), this rule revises the definition of solvent-contaminated wipes as solid waste to conditionally exclude both wipes that are cleaned and reused and disposable solvent-contaminated wipes from the full hazardous waste regulations when handled according to the new rule. The rule defines a wipe as “a woven or non-woven shop towel, rag, pad or swab made of wood pulp, fabric, cotton, polyester blends or other material” [40 CFR 260.10] that are contaminated with solvents commonly used in automotive parts cleaning. 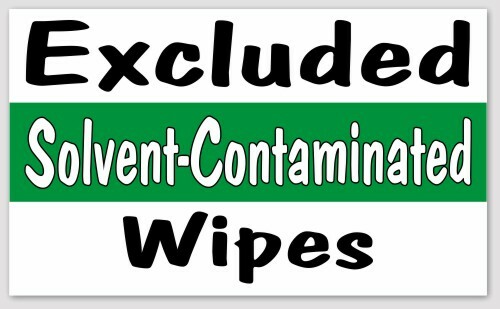 Wipes that are contaminated with TCE or trichloroethylene solvent are NOT ​included in the exclusion. The new management standard streamlines the handling of spent wipes. To implement the exemption criteria, an automotive shop using either launderable shop rags or disposable towels must assure that the spent wipes are stored in properly labeled, leak-proof containers until disposal to the laundry facility or the landfill via trash collection, respectively. 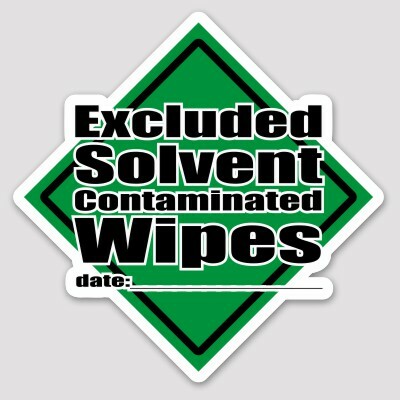 The container can be any closed container labeled “Excluded Solvent-Contaminated Wipes” and does NOT have to be sealed, only closed, during accumulation. Upon disposal the container must be sealed for transport (any free liquid solvent found in the container at time of disposal must be managed as hazardous waste). The good news is that a garbage bag can be tied-off and considered a sealed container and placed in the regular municipal trash for collection, as long the state or local authority does not ban such waste. A label printed from a desktop printer and affixed to the container or bag will suffice. The bad news is that the spent wipes must be segregated from other wastes until such time as sent for laundering or disposal. The frequency at which the laundry and/or trash is picked up must also be well-documented to prove that the spent wipes have been disposed within 180 days of generation. Most regulations tell you what you have to do to be in compliance, but they don’t explain how to do it. That’s where "best management practices" come into play. BMPs are methods that help you to get into compliance and stay there. The following BMPs are recommended for management of solvent-contaminated wipes. Closed; non-leaking; and capable of holding free liquids. A plastic can liner will qualify as a container provided it meets the three conditions listed above. A 180-day accumulation limit from the moment a wipe is first placed into the container. There are various methods to document that the 180-day accumulation is being met, such as a label with a date, an established schedule for pickups, a log of container dates, etc. Use the following list to audit your procedures for proper management of solvent contaminated wipes. 1. Does the facility generate laundered or disposable wipes/towels/rags that are contaminated with solvent? 2. Are wipes stored in closed, non-leaking containers such as a fire safety can lined with a plastic bag? The following compliance assistance information for the state is subject to all of the warranties and disclaimers associated with this internet website [Read full disclaimer]. Please note that this information has been submitted or will be submitted to the state agencies responsible for implementing environmental laws and regulations for their review and comment. This note is provided only for your informational purposes and does not change or alter any warranties or disclaimers, including, for example, your responsibility to seek appropriate legal or technical assistance to interpret the state's laws as needed.